Kick-Off Meeting – ISWI e.V. 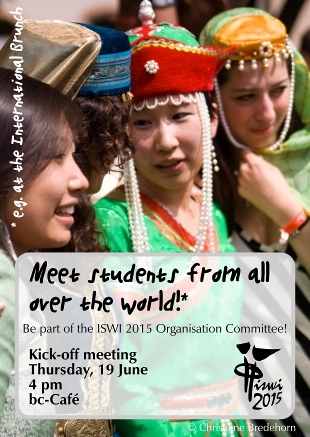 Be part of the ISWI 2015 Organisation Committee! Help us in organizing ISWI 2015 e.g. by inviting interesting lecturers, organizing workshops or cultural events, designing posters & flyers, doing media work or IT, applying for funding and many other things. Btw: If you don’t have time that day, you can also visit us at our office in the basement of House A (next to the launderette).